Coming from the United States, New Zealand has a familiar feel. Same language, similar scenery, and areas reminiscent of major U.S. cities like Boston and Denver. Yet, there is something very different that’s hard to define. As a student there, whether studying abroad or full time, U.S. transplants get the advantages of a common language and recognizable style of education while experiencing a truly unique culture. You probably know kiwis the fruit, maybe even the bird, but if you’ve never met a Kiwi personally, you’re missing out. New Zealanders, or Kiwis, are friendly, easygoing, even adventuresome, as the country’s many outdoorsy activities suggest. 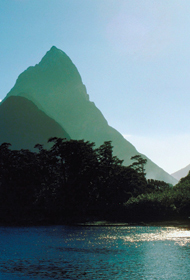 Kiwis have room to roam between the country’s North and South Islands, which are a short flight apart. Between those islands, you’ll find landscapes that vary from lush forests to arid mountains, active volcanoes to quaint countryside. Universities are rooted in the British educational system; one of the biggest differences, coming from the States, is wrapping up university in three years instead of four. Students also start in more career-oriented degrees, taking professional studies from the very beginning of their freshman year. In recent years, New Zealand has seen a surge of immigrants, making it extraordinarily diverse. And the Maori, New Zealand’s native people, make up approximately 15% of its population. Every year, roughly 2,200 American students study at one of New Zealand’s universities or polytechnic schools, and they benefit not just from Kiwi culture but the fusion culture it comprises. That’s a lot of bang for your study abroad buck. The technical stuff: you will need a student visa to attend university full time in New Zealand. Study abroad students can attend university for up to three months on a visitor’s permit. Either way, don’t be afraid to work with your college study abroad coordinators, high school guidance counselors, and administrators at the New Zealand institutions you’re considering—they’re there to help! Otherwise, applying to New Zealand colleges and universities is a lot like what you’d find when applying to schools in the United States. While New Zealand is home to a number of outstanding universities and institutes, here’s a look at six schools that stretch from one tip of the country to another . . . and vary just as much in attitude, atmosphere, and academic programs as location. You might start your education at the Auckland University of Technology pressed nose-to-nose, forehead-to-forehead, with AUT orientation leaders. You are sharing breath. This is the hongi, a traditional Maori greeting. It’s part of the welcoming ceremony of the International Noho Marae orientation weekend. AUT has plenty of welcoming activities for international students, but the Noho Marae weekend, steeped in Maori culture, bonding activities, and tons of food, is a unique welcome to a New Zealand education. Roughly 100 new AUT students from all over the world spend the weekend together—eating, sleeping, hanging out, playing games. They camp in the school’s marae, a Maori spiritual center and important cultural touchstone. (Many New Zealand schools have their own maraes for the Maori students on campus.) During the Noho Marae, students become whanau—family for life. The school offers the Noho Marae weekend not just because students love it, rave about it, and beg to do it year after year but because the weekend fosters inclusivity and cultural exchange. “To have that sense of belonging . . . to feel that you are a part of us,” says Rohit Hazra, an AUT alumnus and current International Student Advisor. Though the weekend is a brief introduction to the school, Maori culture, and New Zealand life, it’s indicative of the University’s attitude toward education: students connect to each other, and the University as a whole connects to its students; they aren’t just numbers, but members of a community; and the only way to learn is to do. AUT has a very hands-on style of teaching. Though internships are relatively uncommon in New Zealand, AUT students are particularly involved in work experiences and cooperative education. If you’re going to travel the world, you must engage with other people and cultures; otherwise, what’s it all for? “You might as well stay home,” Hazra says. Students come to and stay at AUT not just because they have a great business or engineering program, but because they are a family, he says, and those connections last. If you’re looking for a big city, big campus, not-kidding-around university, this is it. Yet, even though the University of Auckland is an urban school, it has a traditional campus feel, with plenty of open spaces and students milling around. Most of the University’s U.S. students are studying abroad. For juniors going to the University, the course work is comparable to senior year in the States, so they may find it more difficult. Some classes are not open to study abroad students, like pharmacy, optometry, teaching, nursing, and medicine, but most others are fair game, including liberal arts, business, science, engineering, and fine arts. Financial aid for U.S. students is available, as are some competitive scholarships. The University also has a cutting-edge music school, state-of-the-art gym, and a brand-new, eco-friendly business school. An almost too-perfect building, the business school gleams in the sun like a CGI backdrop. The classrooms, resources, and student spaces inside are just as cool. And right next door to this building is the UA marae. Like the one found at AUT, it’s a sacred space for Maori students, a low building in a familiar, earthy shade of red. Approximately 4,700 international students attend the University, just under 10% of its total population (almost 41,000 students, undergraduate and graduate). Because they have so many international students, UA offers ample support services; they have three full-time (24/7) advisors, and they’re a resource for parents as well. Everything available to domestic students is available for internationals, plus an extra level of support from the moment they arrive, including staff advisors. On-campus international student housing is also available, though many choose to live mixed in with their Kiwi counterparts. With Auckland, the biggest city in the South Pacific, at their fingertips students never lack things to do: theater and museums, clubs and restaurants, bike trails and tons of sailing opportunities—with the highest number of boats per capita, it’s known as the city of sails. Clara Ciminelli, a recent grad of Northeastern University in Boston, knew she wanted to take full advantage of her study abroad options. “Since New Zealand is so far away and the airfare isn’t cheap, I thought I might not get another chance to travel there,” she says. The University and Auckland itself still felt comfortable and accessible, coming from a city like Boston. Save as much money as possible, advises Ciminelli. “Even traveling on the cheap and staying in hostels can add up.” And driving on the “wrong” side of the road? Not a problem. “Renting a car and just exploring the country is absolutely the best way to see New Zealand,” she says. In a country known as a tourist destination, the city of Queenstown stands out. Located on the South Island, it feels like a different world from the urban centers up North. The city itself is tucked between the Shotover River and the base of the Remarkables Mountains. The surrounding green hillsides are dotted with sheep, perfectly symmetrical vineyards, craggy peaks, and low forests. Its rugged terrain is similar to the U.S. Rocky Mountains. And, like the Rockies, Queenstown is an outdoor recreation playground: skiing, hiking, snowboarding, speedboating, bungee jumping, skydiving, white water rafting, and more. Surrounded by as many hotels as mountain peaks, Queenstown is an ideal place to study tourism and recreation management, and that’s just what students do at Queenstown Resort College (QRC), studying hospitality management or adventure tourism. Taught in the internationally known Swiss style, QRC offers a particularly cost-effective path to a hospitality management degree. The ability to work overseas is another major draw: students can spend a postgraduate year in Australia, New Zealand, or Switzerland. And all QRC programs include internships anywhere your visa allows. In a college of roughly 300 students, one-third of those students are working off campus at any given time. Thirty percent are international, but the school accepts no more than four students per country. There are different costs for international and domestic students as well. You can pick out QRC hospitality students easily; they’re the ones wearing business suits. With hospitality students, QRC uses a professional excellence points system (PE). For example, students lose points if they’re late to class or unkempt. But it’s not all suits and ties all the time. QRC’s dorm, a renovated resort called the QRC Lodge, overlooks Lake Wakatipu and has all the amenities students absolutely need—video game systems, comfy couches, and awesome food. After class students still run around in sweat pants and jeans, leaving notes on each other’s dorm room doors, in a hurry to go downtown to hang out. They won’t lose any professional excellence points for that. Sinclair says there’s a huge demand for QRC grads, and most leave the school with two or three job offers. They tend to advance quickly, he says, becoming supervisors in four- and five-star hotels or in adventure businesses not long after graduation. Sinclair credits that to students leaving the school fully trained, ready to hit the ground running. The University of Otago’s safe, sprawling campus is nestled in the heart of New Zealand’s biggest “college town,” Dunedin, where approximately one out of every six is a student at one of the local universities. Dunedin is also reminiscent of another classic college town, Boston, with old ivy-covered buildings and a downtown full of students and dark little taverns—except autumn hits in May instead of September. Another large university (over 22,000 students) with seemingly endless programs of studies and resources for international students, Otago is becoming more selective in its admission. The oldest research institution in the country, all Otago professors conduct some research, no matter their discipline. Otago also boasts a number of faculty and student award-winners, including Rhodes Scholars and an International Fulbright recipient. All honors students do their own research too, though international students may need to be more proactive in finding such opportunities. The University has the only dental, pharmacy, and physical therapy schools in the country, plus biomed sciences, AACSB-accredited business courses, and marine biology. Marine studies students benefit from a nearby aquarium and access to Antarctic research. Otago accepts U.S. federal aid, and has a visa officer and U.S. financial aid counselor on staff. And, because the majority of students are not local, Otago has ample student support services to help those adjusting to university life. Living off campus—likely the first time students have lived alone—is a crash course in independence and responsibility, though there are plenty of social activities too. The University developed the Campus Watch program to support the off-campus community, with trained University employees assigned to neighborhoods as a 24/7 safety net. Otago assigns international students to Kiwi hosts too; seniors mentor new students during their first semester, then let loose as time goes on. In true New Zealand fashion, there are plenty of outdoor activities as well, including hiking, biking, and exploring botanical gardens. Rugby fans will appreciate the new stadium in Otago, built for the 2011 Rugby World Cup games. And if all that doesn’t win you over, Dunedin is also the home of a Cadbury Chocolate factory, complete with a working chocolate waterfall. Students from 100 different countries attended Otago in the 2009–2010 academic year. About 100 U.S. students are currently pursuing “full degrees,” meaning they are fully enrolled at Otago; there are approximately 400 additional U.S. students studying abroad. “I wanted a college community,” says Mary Kaitlin Roney, a junior from The Johns Hopkins University in Baltimore, Maryland, who studied abroad at Otago. Despite its size, she says everyone at Otago seems to know each other. Windy, wet Wellington is New Zealand’s capital. But despite its cool Seattle-esque weather, it’s a hotbed of international affairs and foreign diplomacy. Like the universities of Auckland and Otago, Victoria University of Wellington is a big, comprehensive school with all the opportunities and experiences you would expect, so many of the key differences between these universities lie in their locations. Wellington is a chic city and international hub, and Victoria University’s diplomatic dialogue series and parade of visiting foreign ambassadors and speakers reflect that. For students looking to get into international relations and diplomacy, there’s no better place to be. Among the typical extracurricular activities, Victoria also has an International Leadership program that encourages students to think globally through seminars, speakers, and activities that span their time at the University. Over 1,400 students are currently involved, and a free abridged version is available to study abroad students. But if politics isn’t your thing, you may find your niche in one of the high-tech science programs. Traditionally known for its strength in the social sciences, humanities, and law, Victoria has spent the last 10 years building its science departments, developing them into world-class programs. The MacDiarmid Institute for Advanced Materials and Nanotechnology, named for Nobel Prize–winning chemist and alumnus Alan MacDiarmid, is based out of Victoria. Students can study nanotechnology and advanced materials. Or they can head over to the School of Design—instrumental in the movie Avatar—to be on the cutting edge of the techie side of film and computer graphics. Of Victoria’s 22,000 students, roughly 3,000 are international, with about 100 different countries represented. Victoria also has a handful of U.S. exchange partners, including Carnegie Mellon University, State University of New York New Paltz, and the Virginia Institute of Technology. Once a school primarily for the people of Wellington, Victoria is attracting a lot of New Zealanders from other cities as well as international students. Hannah Lawrence, Victoria’s International Marketing Coordinator, says students are “drawn to Wellington.” They like the metropolitan feel, from the high culture to the fringe festivals. Home of the Te Papa, New Zealand’s expansive, impressive, and free national museum, Wellington is a walkable city, with a tightly packed downtown built on the waterfront. The winding streets are full of classy young professionals, and students are called “metro-scarfies” for their expertly tied scarves and sleek black wardrobes. But you don’t have to go far outside the city for proper Kiwi pubs and rugby hooligans. Rotorua, on the North Island, is the heart of New Zealand’s Maori culture. No area in the country is so steeped in tradition, and students at the Rotorua’s Waiariki Institute of Technology get to immerse themselves in those traditions too. Surrounded by mountains and 16 lakes, the city, like Queenstown, is a haven of outdoor recreation. Not surprisingly, Waiariki has strong sports studies and training programs. Students work with top New Zealand athletes and get hands-on training, just one to two hours from some of the best sporting areas in the country. Admission to the Academy of Sports is very competitive, but internationals can apply. Among a wide range of courses, students can major in bicultural journalism, with classes that cover Maori issues in depth—examining the Maori perspective, overcoming tokenism, and changing world-views. They leave prepared to cover other cultures and peoples at news and communications organizations anywhere in the world. Waiariki recently added its state-of-the-art School of Forestry, Wood Processing, and Biotechnology, where sustainability is a central tenet. The school owns a sawmill and provides vocational training in commercial forestry, logging, and forest management. They are moving into biofuels, hydroponics, and advanced nursery practices. Though the school is home to few U.S. citizens, Waiariki has a wide range of students of varying ages and backgrounds. One year can be an excellent value, but as a county-sponsored institution, international students do have higher tuition. Academics are central, but just as important is cultural immersion, says Graeme Rennie, manager of Waiariki’s international center. To focus wholly on academics is to miss a crucial part of studying abroad. Across the street from Waiariki is Te Puia national park. Looking out over the park is like looking at a scene from Land of the Lost, with steam rising through the trees, erupting geysers, and boiling mud pools, but it really is a snapshot of a lost world, where Maori settled roughly 700 years ago. Part of Waiariki’s studies include harnessing that geothermal activity and steam power, as the city is nestled in the crater of an ancient volcano. When students aren’t in class, they can travel up the road to ZORB: rolling down the hills in giant plastic balls like hamsters. Or they can visit Maori villages for a glimpse of life before English settlers. It’s easy to draw comparisons to well-known U.S. cities, and if and when you go, you’ll know. But it won’t take long to see New Zealand also has something all its own.